Forging a balance between structure and soft sculpture. 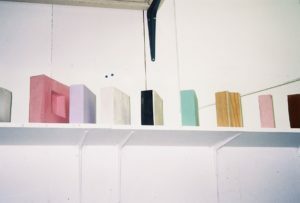 There was a piece that immediately stood out to me at The Koppel Project Hive‘s exhibition “Notes On Painting”, not just because of it’s powerful geometric form or graphic pastel coloured tonalities (which were very appealing), but because of it’s not completely formal state, a plinth sculpture with an organic feel. 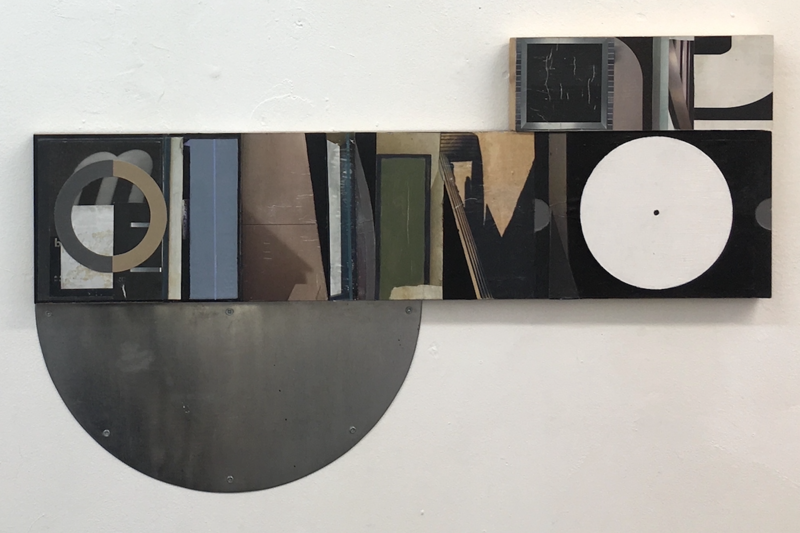 “The structure of the body is a complex object with the potential to form a multitude of compound angles and perhaps the more I think about it, my steel/wood constructions have a direct relation to the figure and form a substrate for display.” Andrea V Wright mentions. 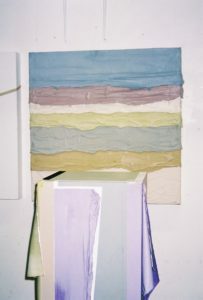 At the moment, there is a wave of artists responding to complex structures or forms, although Andrea’s works slips between categories, addressing different materials, methods and reference points whether geometric, organic, readymade, crafted, economic, reductive or embellished, pulling apart and extending disciplinary boundaries. Andrea V Wright (b. Bebbington, Wirral) studied a BA in Public Art and Design at Chelsea College of Art and Design and graduated with a Distinction in Masters Fine Art from Bath Spa University in 2016. She has exhibited at Riverside Gallery, Richmond; Isleworth, London; Truman Brewery, London; Oxford Castle, Oxford; Bath Spa College of Art and Design, Bath; Bath Artist Studios, Bath; Fringe Arts Bath Festival, Bath; 44AD, Bath, Collyer Bristow Gallery, London, Arthouse 1 amongst others. Residencies include The Cells Residency, Trowbridge Town Hall, Wiltshire amongst others. She has been awarded the Bursary Award, Royal British Society of Sculptors (2017) and the Jerwood Drawing Prize (2017) amongst others. Andrea is currently living and working in Bath. Given your mum and sister’s jobs, you grew up surrounded by design, whether fashion or interiors. How has this influenced your way of working with shape, colour, form, or material? My Mother and Sisters’ careers in Fashion had a huge influence on me. Whether Punk or New Romantic my sisters’ style sense was always fascinating to me as the younger sibling. Growing up near London in the 1980s street style, culture and tribe identity was everywhere, authenticity and detail from the cut of your clothes to your hair had to be just right. I used to rummage through jumble sales and charity shops for vintage items, no one seemed to have any money so it was about adapting clothes, being creative and throwing things together. You worked in fashion and fashion styling in the late 1990s. Does your use of drapery when working as a stylist parallel your use of configuration and reconfiguration? After leaving Chelsea in 1994 I began working as an assistant to a fashion stylist. Handling garments made by Alexander McQueen and Hussein Chalayan gave me an understanding of the craft and construction involved in high fashion and accessories. On styling shoots it’s the small details that can make all the difference, bring it all together and establish the illusion. This has certainly influenced my decision making when it comes to sculpture. Going on to work with my sisters’ company ‘The Wrights’ in New York, it was a small family business with all hands on deck. I was often asked to cut patterns, embellish garments or go sourcing for hardware and trims from the fashion district in mid-town Manhattan. There’s no doubt that my eye was absorbing constantly and the handling of different fabrics, leather and yarns has influenced my thinking on material, proportion & shaping and it is something I’m drawing more and more into my work. You are interested in forming structures with complex angles. How is your use of angles linked to your background in life drawing? Forming structures is a fundamental aspect to my practice and underpins most of the work I produce. I grew up watching my father as an Architect drawing plans and elevations for his projects, drawings that were to me a convergence of line. Life drawing was a significant part of my art education. I preferred the short poses as the model would usually be able to hold a more challenging or awkward pose. Capturing the distribution of weight in the stance, angle of hips, shoulder line, fore-shortening, proportion etc. were vital to making the drawing ‘work’. 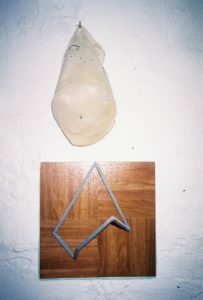 The structure of the body is a complex object with the potential to form a multitude of compound angles and perhaps the more I think about it my steel/wood constructions have a direct relation to the figure and form a substrate for display. You photograph buildings as an on-going investigation into spatial and architectural structures. Do you consider your photography as a final work or as an element in your working process? Photography is very much a tool in my working practice and thus far not final work. I occasionally post photographs on my Instagram account as ‘what I’m looking at’ but most of the time they form an image bank of what stimulates my eye and my thinking. The urban environment made up of the random, absurd and accidental compositions. 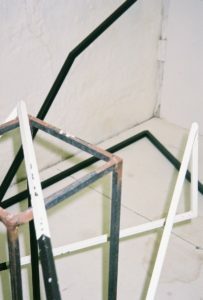 Juxtapositions of architectural materials, line, shape constructed and deconstructed. Photography functions as an indexical working catalogue. Congratulations for being selected for the “Jerwood Drawing Prize 2017”, the largest and longest-running annual open exhibition for drawing in the UK. Can you tell us more about your selected work “Cusp”, which is currently on view at The Edge Arts, Bath as part of the prize? I was thrilled to have been selected for the prestigious Jerwood Drawing Prize. My work “Cusp” consists of a 12mm steel bar that has been cut and reconfigured into a dynamic continuous steel line. My research into non-euclidean geometry during my MFA comes to the fore and as I state in the catalogue ‘I draw to describe not only the line but the spaces between the line, seeking out methods of reflecting the ‘impossible plane’ using light, trace and spatial retraction. The drawing is freed from the frame, folded, bent and contorted to create semi-architectural objects that evolve from the original: line becomes an object in space. “Cusp” started as a line drawing realised in three dimensions, projected back onto a surface where the shadows create an evolution of the original. It balances on the plinth, just as the piece itself inhabits the space between drawing and sculpture’. Can you develop on your working process? Do you work with maquette’s? My working processes vary and are dictated by the materials I am working with. I do make maquettes, it’s a way of thinking/sketching in three dimensions. I fold, wrap and cut card, fabric and wood to construct small models and decisions are made like ‘what happens if I extend this or what happens when I close this gap?’ Often these juxtapositions of maquette and found objects will be hung on the wall of the studio so I can ‘live’ with them for a while or until they come into play, measured and scaled up. In one of your latest Instagram posts you mention “It’s important to me to work with different materials, methods and reference points whether geometric, organic, readymade, crafted, economic, reductive or embellished”. Can you explain this idea further? I suppose what I mean by this is allowing the materials to speak for themselves, by any means or methods to get the work made. Your works combine a structural element with a soft sculpture component. How fundamental are the themes of tension and balance in your practice? The materials I use and the method-based research I employ have a physical nature. When works are scaled up they are usually in relation to the body whether hand-held, torso-sized or human-scale. The themes of tension and balance can come into play at any time through the objects or the actual making itself. 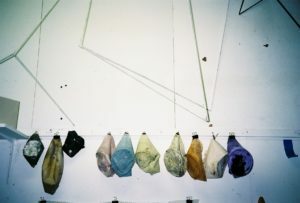 The fabrication process is almost performative as the soft sculpture elements of nylon, latex, fabrics, etc. lend themselves to tactile manipulation – stretching, extracting, flattening – with my body moving in relation to the construction. 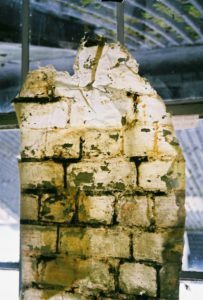 The precarious and temporal nature of conditions and of objects – the idea that nothing is fixed and sometimes, right out there on the edge, they could collapse at any time – interests me. How important are references in your practice, and could you mention your most significant ones? My practice references modernist aesthetics. Certainly with my structures, the use of ready-made steel rods or pre-cut wooden battens references functional and everyday materials. I am interested in the extension of disciplinary boundaries and there are plenty of exceptional contemporary sculptors who influence my thinking/making processes even though my work does not directly reference theirs. Artists such as Lynda Benglis, Claire Barclay, Monika Sosnowska and Nairy Baghramian have a nuanced and fluid command of their practice. I am impressed by the ambitious scope of their installations and the understanding of signifiers, details and execution in the sculptures themselves and in the siting of their works in relation to space/site. Your interest in latex derived from Heidi Bucher’s works, which you discovered while coursing your MA Fine Art at Bath Spa University. Why are you drawn to this perishable medium? I had just started my MA when I discovered the work of Heidi Bucherthrough a pivotal show at The Approach Gallery in 2014 and there were also a piece at Frieze that year. Through her work I was immediately captivated by the potential of latex to trace surfaces and its ability to hold a moment in time. During a residency at Porthleven in Cornwall I was able to create my first substantial latex piece, which was a cast of the hull of a boat. it was incredible just how much detail the latex picked up from that boat. Since then I have had a bit of an obsession: there’s nothing quite like it for tracing surfaces and creating accreted ‘artefacts’ of the original object. Phenomenological remnants of a passing moment, pigmenting, wrapping and peeling, I have used it in so many ways knowing full well that as a material it is perishable and unstable. Perhaps that’s why I’m drawn to it though its use does pose a number of problems. There is a nostalgic aspect in your practice, from making prints that re-revealed an experience of confinement in a prison cell while at your residency at The Cells of Trowbridge Town Hall, to tracing, following or using shadows in your works. What draws you to this focus on absence, shadow, time, and life? The nostalgic element comes into my work through memory and attachment. The seen and the experienced are the building blocks to my engagement with my practice. Whether through shared or personal history, our negotiations with our past are indelibly marked on our present. There can be a lot of physical labour involved in making or constructing my works and there’s something attractive about the transitory nature of them. When I make my installations by tracing shadows of my steel structures onto the wall and floor, the work extends out into an expansive spatial drawing, hinting at the potential to alter space. At the time of de-install the tape is peeled off and I am left with a ball of used tape and a photographic record of the work in-situ. Expansion and Retraction. The Residency in The Cells, Trowbridge brought very much to the fore thoughts of the soft body inside the steel barred shell, confinement and the fragility of existence. I am very much involved in my Bursary Prize at the Royal Society of Sculptors and want to make the most of this opportunity through the mentoring programme. The Bursary culminates in an exhibition at the society’s gallery space in South Kensington in September. I am also very excited about being invited to exhibit at the New Relics Exhibition at Thames-Side Studios Gallery on 2-24 June, curated by Tim Ellis and Kate Terry.